Allows to free a lot of space on your hard drive without deleting any files! 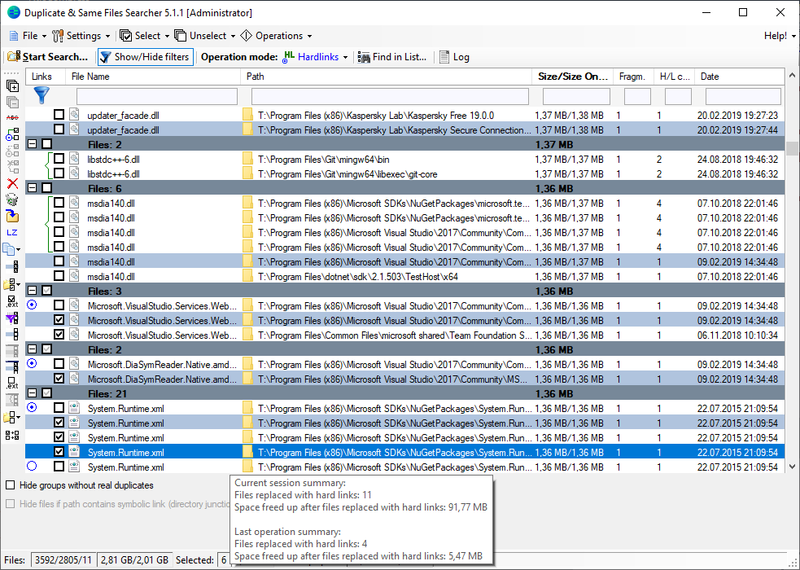 Duplicate & Same Files Searcher (Duplicate Searcher) is an application for searching duplicate files (clones) and NTFS hard links as well symbolic links to the same file. It searches duplicate file contents regardless of file name (true byte-to-byte comparison is used). This application allows not only to delete duplicate files or to move them to another location, but to replace duplicates with NTFS hard links or symbolic links (new in version 5) as well (unique!). This application was developed because I haven’t find any similar application which allows to operate NTFS-links. A NTFS hard link is the file system representation of a file by which more than one path can refer a single file in the same volume. NTFS hard links allow several files to share the same space on the disk (the same file). For example, several applications can use NTFS-links to the same version of the library instead using different copies of the library files. If several hard links point to the one file, deleting of any hard links doesn't cause deleting of the file and freeing disk space until the last hard link to the file will be deleted. Fast search engine (byte-to-byte comparison and hard/symbolic link detection algorithm are used). Detailed visualisation of duplicate files, NTFS hard links, junction points and symbolic links (unique!). Shows fragmentation of files (unique!). Shows compressed NTFS files in color. Manual and filtered selection files to delete, move or replace with NTFS hard links. Allows to move and delete files. Allows to replace files with NTFS hard links (unique!). Allows to replace files with NTFS symbolic links (New in version 5!). Allows to compress files on NTFS volumes. Allows selecting disks and folders to scan. Supports long paths (path longer than 260 characters). Supports for checking NTFS-permissions compatibility for the files being replaced by hard links. Supports ignoring differences in MP3-files metadata (ID3-tags) and comparing the music MP3-content only (experimental). If you use Windows 7, Vista or XP, Microsoft .NET Framework 4.0 must be installed in order to use Duplicate & Same Files Searcher. Windows 8/8.1/10 have pre-installed Microsoft .NET Framework 4.0. Languages: English, Russian, Japanese (translated by Tilt), Italian, Polish, French (translated by Colok). Free Download Duplicate & Same Files Searcher! Checked for viruses with Kaspersky Internet Security 2019. See also VirusTotal results for Portable package and Installer. If you find Duplicate & Same Files Searcher useful you can thank author and support future development by donating! I would like to remain Duplicate & Same Files Searcher free of charge as a gift to the online community, but I need to pay for hosting and development tools. I would like to ask you to make a donation from €2, but of course I appreciate any amount. Please note that donations to Duplicate & Same Files Searcher are not tax-deductible for income tax purposes. To donate, click on the Paypal Donate or Yandex.Money Donate button. Thank you!